Home / Modern Pest Blog / Ice Dams: Moisture, Mold, Mildew and PESTS! 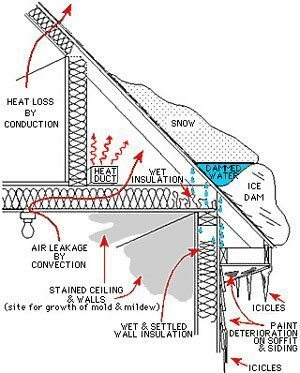 Ice Dams: Moisture, Mold, Mildew and PESTS! In New England, that clean white blanket of snow can be very picturesque, and even fun – if you enjoy getting out to play in it. However, it can also bring a whole host of concerns for homeowners, from snow removal, slippery paths, to damaging ice dams! 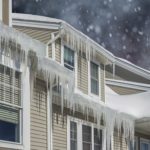 According to the University of Minnesota Extension, ice dams are roof ice buildup “that forms at the edge of the roof and prevents melting snow from draining off the roof.” As a result, the water may seep back into the house, damaging the home’s insulation, drywall, and electrical systems. If left unresolved, ice dam moisture may lead to mold, mildew and rotting wood in your home. Which could then result in health concerns and pest issues! But WHY do I have ice dams? The reason that ice dams occur can be even more complicated. The first ingredient is snow. Which, is easy to come by in New England six months out of the year. Next, there must be some source of heat to warm the roof’s surface to above freezing, which melts the snow on the roof. This often occurs through heat conduction. Meaning, the heat in your home rises through gaps in the ceiling and inadequate insulation. The heat loss then radiates warmth to the roof’s surface melting the snow that is on the roof. The snow melt then refreezes lower down on the roof where the roof temperature is below 32°F., which then creates and feeds the ice blockage. The water runoff, having nowhere to go, will backup on the warmer, upper portions of the roof and will eventually seep into your home. A variety of reasons can cause heat loss. Most often it is a result of improper ventilation and inadequate insulation. However, exhaust systems, chimneys, and leaky ductwork can all be sources of heat. It is best to consult a professional to determine the exact reasons for your heat loss. RELATED: Why use T•A•P Insulation? I have ice dams! What do I do? If you are dealing with ice dams today, you can take some immediate steps to protect your home and prevent severe water damage and mold. 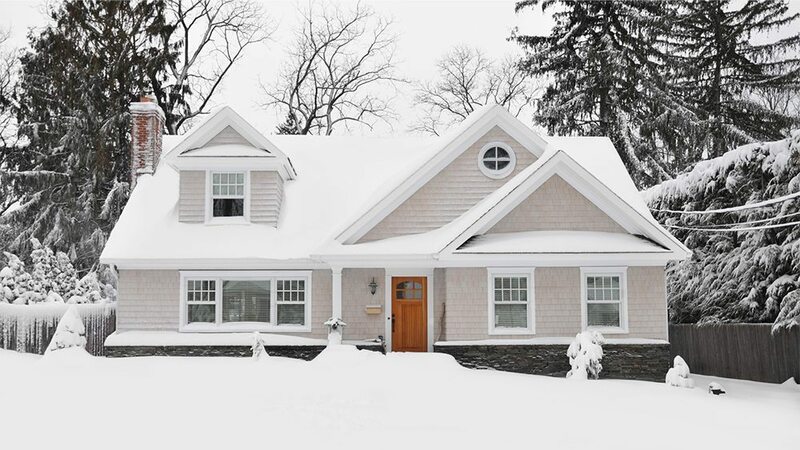 Removing snow from your roof will eliminate the essential component needed to create ice dams. Roof rakes or a licensed and insured professional snow removal service are a few options to consider. Low-pressure steaming will gently remove the ice build up, through the use of directed high-temperature steam. The spray is gentle and will not damage a roof like a pressure washer, hammer, or pickaxe. The use of chemicals and ice melting products can cause a larger problem. More snow and ice can melt and refreeze and cause more damage to homes and businesses. Proper and adequate roof ventilation can help your roof maintain uniform temperatures. Natural attic ventilation systems will dry the attic space and remove heat buildup. Tighten up the ceiling with better insulation. Sealing air leaks, will help prevent warm air from escaping. Every season brings a new threat, and winter is no different. Call the professionals at Modern Pest Services at 1-888-997-3312 or contact Modern to schedule a quote today for pest control and extermination.